Whenever I see scary numbers next to power supply units in hardware news I get a feeling that they had completely lost touch with reality. Yes, some computers can consume as much power as your microwave. But bulk of them consumes way less than you even think. 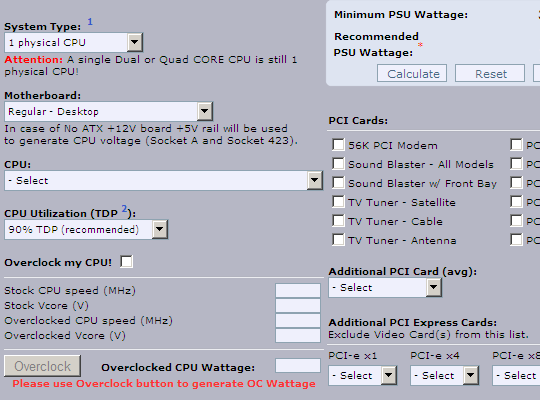 eXtreme Power Supply Calculator is online app that allows to compute expected power wattage of multiply PC components put together. Site has list of possible hardware parts from which you can choose. When you do and hit calculate it gives you approximate wattage for this combination of parts and recommended PSU wattage. Site is aimed to satisfy power users, so selection of components is more than extensive. You can select anything from common (or not) CPUs to freeform combination of case fans and water pump on top. Site is very vocal (in large red letters) that free lite version is for personal use only. Some features like amperage data and multiply video cards calculations are also reserved for paid pro version. May or may not matter for power users and definitely won’t for regular users. Online, comprehensive, easy to use.